Stoke Newington Kris strikes a characteristic note on the issue of apologies for the slave trade, ticking off Cllr Patrick Vernon for his view of the matter. Want to know more about Patrick? Here's a profile of him by the Improvement and Development Agency for local government, whatever that is. Be good to hear from you councillor, by the way. P.S. My take on race, slavery's legacy and related matters has just gone up at Comment Is Free. The turnover of shops and cafes in Lower Clapton Road tells its own story of my neighbourhood: rapid and eclectic sums it up. I took all these snaps while walking back from the Narroway post office this morning. On past Saturdays the Turkish one - I think it's Turkish - has had a lady in a headscarf sitting in the window seat preparing dishes, presumably for "authenticity". I've yet to try the Caribbean one or the Italian effort next to Biddle Bros wine bar on the corner of Linscott Road. You can tell just by looking at Parioli that it's full of Guardian readers, God bless them all. The remaining two images capture a quintessential Clapton paradox - we are simultaneously grubby and green. Click on the pics to see them bigger. And now the royal visit has been documented on the royal website. "The school garden at De Beauvoir Primary School in Hackney, east London, is one example. Last year children from the school helped to construct reclaimed wooden planters and a grid of raised beds in the school playground, which they planted with vegetables and herbs. Although it is still in its infancy, the weekly after-school gardening group attracts between 15 and 20 pupils. Over the coming year the children will become involved in a range of activities, including creating willow structures and mini wildlife habitats and planting trees." "The man with a list of sinecures as long as his tongue who is almost invisible in Hackney. Despite the remuneration he gets from the quangos he sits on and claiming a salary and expenses from Hackney residents, he never misses an opportunity to encourage us peasants to volunteer more, volunteer for what, more insults from him?" Sounds like quite a, well, guy. What's his opinion of himself, I wonder? The saga of the Palace Pavilion nightclub seemed to have ended earlier this year when a judge agreed with the council and local residents that the place had become a magnet for serious criminality and that licencee Ken Edwards wasn't running it properly. Read some of my previous pieces on the subject here and here. Now, though, there's the prospect of a sequel. Mr Edwards seems to have moved his operation into the Ship Aground pub on the Lea Bridge Road and is seeking permission to extend its opening time into the early hours of the morning. More on this soon. 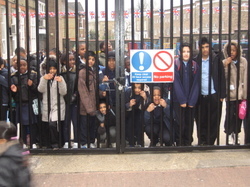 Prince Chas's return visit to Claptonian territory was - you guessed - to my younger kids' primary school. After, this Alan Johnson, Jamie Oliver and Tony Blair, head teacher Dame Anna only the needs the Queens of England - Elizabeth II and Elton John - to show up and she'll have had a full house of national dignitaries. I couldn't be there to witness the royal arrival myself - I had a bun to eat in Clerkenwell - though I'm told the kids enjoyed it, and at the end of the day I greatly savoured the unusual sight of our niqab-wearing parents and their children clutching union jacks. Come to think of it, of any of our parents doing such a strange, unnatural thing. Excitingly, I'm told that the next Chancellor of the Exchequer (or thereabouts) and his housing minister wife have bought a house in Stoke Newington and, being the parents of three children, applied for places at A Local Primary School. Why Hackney, you inquire? Must be because a pair of Brownites settling in Islington would have looked like a betrayal. On the other hand, Stokie is just a spit from the border and therefore a safe cultural distance from we lowlife over here. Or am I being horribly unfair? "I live in South Hackney, which isn’t known as the Notting Hill of East London but may become so if I plug the soubriquet often enough, and there, as in many inner-city areas, the well-off and well-behaved live alongside people who can be loud, aggressive, occasionally downright uncivilised. And that’s just the parents, never mind their kids. It’s a rare week that I don’t witness a crime or misdemeanour, from littering to verbal abuse to vandalism to dangerous driving. Do I do anything about it? Hardly ever. Why not? The same reason Cameron doesn’t: physical fear. Rapid risk-benefit analysis always favours doing nothing. What is to be done? I have one modest suggestion. The big change in places such as North Kensington and South Hackney is that the respectable working class have upped and gone and the people like Cameron and myself who have replaced them are reluctant to assert ourselves in the same robust way that the people who lived in our homes 30 or 50 years ago would have done. The way a community used to enforce social norms is that respectable working-class women would threaten miscreants with stigmatisation, and respectable working-class men, the bigger ones at any rate, would threaten them with force. Social stigma is a difficult thing to recreate. But becoming more willing and able to threaten force is actually quite easy, the work of a few months in the gym and a modest adjustment to the middle-class mindset." So comment, yuppie, if you're hard enough. "What is happening to this once great country? We used to be listened to, now it seems we are in the hands of a bunch of chancers who are in the process of getting their grubby little hands on the people's land in the name of the Olympics. In the football community's eyes, they have tarnished its name forever. We are sick of the very mention of the word Olympics. All it does is conjure up visions of smug politicians giving themselves a mutual pat on the back for all the so-called wonderful things they suppose they are doing for the 'plebs'." "Hackney councillors and officers, our MPs, our London Assembly representative and the mayor of London may...feel some shame or even a twinge of remorse about the way they have acquiesced with the continued LDA assault on the common land and metropolitan open space of Hackney Marshes." The displeased have good words only for Conservative Cllr Simon Tesler, though I'm not sure he'd be everyone's idea of a natural ally. This one will run and run. All comments, tips, tittle-tattle and coherent opinions warmly welcomed here at Claptonian (see sidebar for email address).